Trump, Gorsuch, & The Supreme Court: Will Progressives Act in Good Faith? 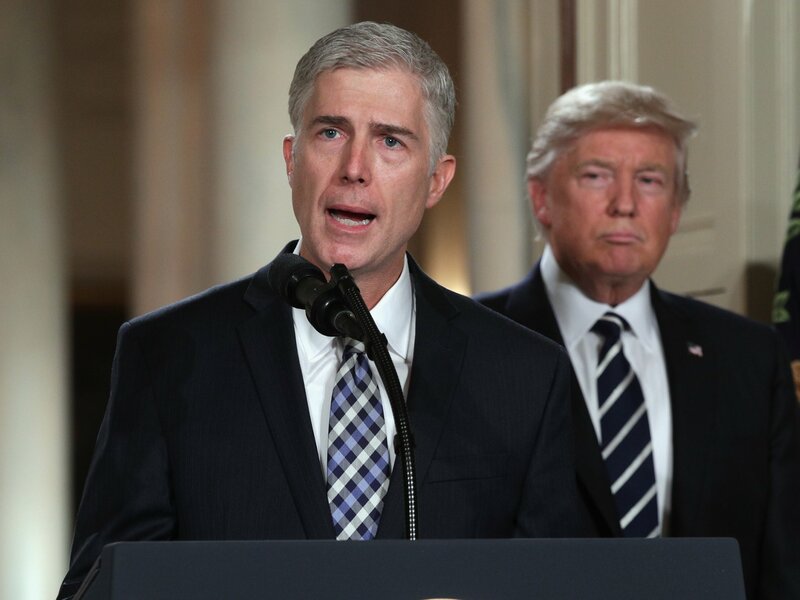 Democrats should hold confirmation hearings and approve President Trump’s Supreme Court nominee, Neil Gorsuch, in a respectful, timely way. In other words, they ought to act in the way Republicans should have acted with President Obama’s pick, Merrick Garland. How Liberals and Progressives respond to this nomination will show whether their ongoing protests and anger are truly principled or are just aimless expressions of emotion. Most every action Trump has taken since becoming President has been abnormal, irresponsible, immoral, incompetent, or counter-productive. He is, in my opinion entirely unfit for the office of President, and has not the moral, intellectual, nor executive substance that this office requires. Yet I am in the electoral minority. Donald J. Trump is the President now, and even if he does not treat the Presidency with the respect and dignity it deserves, the rest of us should. All of the Opinion pieces I’ve seen so far that have argued for Democratic obstruction of the Gorsuch nomination, do so on two primary grounds: the Republican travesty of blocking Obama’s pick for the past year, and the Conservatism of Gorsuch. Both of these reasons come up short. First, it is true that one of the most disgusting abdications of responsibility that the GOP leadership ever did during Obama’s Presidency was this absurd refusal to even meet with the lawful, reasonable, and constitutional nomination of Merrick Garland. It was blind partisanship, national integrity be damned, and Republicans should be ashamed of themselves on every level for perpetrating such an act. The rest of America, though, did not agree with this assessment. Yes, a majority of Americans wanted Garland to have a hearing and vote, but it was hardly a major campaign issue. No one went to the streets in huge numbers like in the Women’s March or in the wake of these immigration moves by Trump. It didn’t really come up in the debates, and did not gain very much notoriety. Most tellingly, Americans refused to enact an electoral punishment for such grandstanding. This ought to be respected. Americans were not worked up over the GOP holding the Court hostage, and so to feign such offence and desire for revenge is just the flip-side of the very partisanship we’re trying to protest. The Garland nomination languished away while all the Bernie bros and girls complained about the “millionaires and billionaires” supposedly destroying our country, Hillary was played ideological catch-up, and the world remained enraptured by the latest hottake of how Trump was the reincarnation of Adolph Hitler. In short, the people who disagree with Trump’s court pick now were not equally enraged by the GOP’s grandstanding–at least, not enough to do much about it. The best thing that can be done now is to treat the political process with the respect that Republicans have refused, not to try and “make a point” or “punish them” or “get revenge”. Secondly, on Gorsuch’s ideology and qualifications: he is a mainstream, respectable, and brilliant legal mind and writer. He deserves a seat on the court. Even some high-profile Liberals agree. He is principled while not being ideological. He has defended broad religious freedoms for obscure religions and Native American tribes–not just white Christians. He has come out strongly against government abuses of the Fourth Amendment and strongly sides with the citizenry over against government claims of unbridled surveillance and policing excess. Even LGBT rights advocates ought not be too worried. He will not be a rubber stamp to Trump’s agenda, and seems to have no problem speaking truth to power. Yes, he is an originalist in the vein of Scalia, but let’s not lose sight of what that really means. It does not mean that they believe the Constitution can never change. In fact, originalists think it should be changing much more than it does! It simply means that certain statutes were passed with certain intentions, and those original intentions ought to be respected when cases are brought before the Court. If times change and the national mindset changes, then great! The Constitution provides a ready-made framework for amending it to reflect that change. Originalists are not anti-change, they are pro-change, through the means designed to facilitate that change. Gorsuch has been very critical of groups–Republican and Democrat–who seek new changes in politics and social policy purely through litigation over legislation. We don’t pass laws anymore, we just bring lawsuits. Yes, much of that environment is because of the do-nothing GOP Congresses of the Obama years. But fixing that doesn’t mean doubling-down on the failed policy, thus further eroding our institutional stability. Strategically, if Democrats are to scuttle this nomination Trump’s next nominee would likely be truly extreme and scary, and Democrats would have wasted their political capital for naught. This was the first act of President Trump that has seemed (dare I say it?) normal. Even if the roll-out was a little reminiscent of reality-TV, the choice itself is a serious one. Trump has the emotional stature of a four-year old. Starting an unnecessary war on this nominee would likely just cause a temper tantrum and further systemic chaos. Proceeding with the hearings and approval process would encourage him to do more “grown-up” things like this. I’m not saying that fear of Trump’s immaturity ought to make Democrats wilt. Rather, I am telling them wisely parse out the wheat from the chafe and pick their battles. So yes, protest at airports and city streets as Trump writes his executive orders and bypasses the normal order of the legislative branch. Yes, call him out on his lies and misogyny. Yes, continue to analyze his policies and see if they will actually deliver on the promises he has made? But attack specific things and policies not Trump in the abstract. If every little thing that Trump does causes Progressives to turn everything to 11, our institutions will only further erode. If Trump’s opponents are acting in good faith, and not blind ideological rage, they will support, promote, and strengthen the good order and process that Trump threatens to weaken. As I sit and watch the Democrats lining up to oppose the nomination, some doing so mere minutes after the nomination, I have to ask: whatever happened to “when they go low, we go high”?